The last two days had excellent evening tides for bass or mullet fishing. Unfortunately I couldn't go on either day because of other commitments but some of my pals gave it a go and caught a number of reasonable bass on lures and mullet on maggot flies. 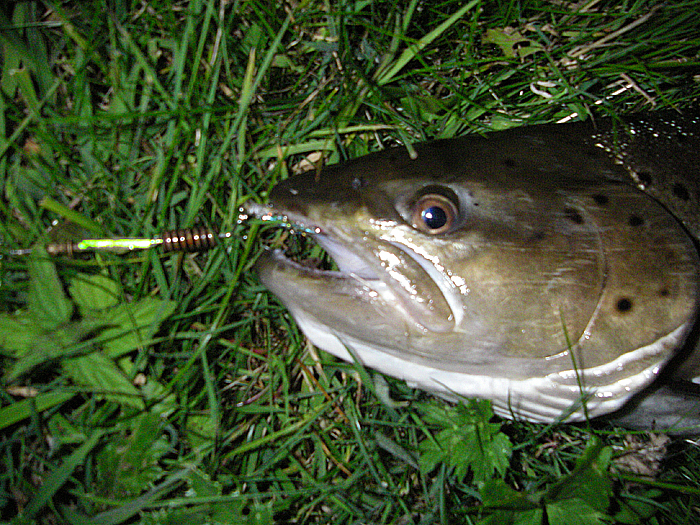 By the time I could get away to fish yesterday evening it was already growing dark so I thought I'd try the lumi-spinner and see if I could manage to catch a consolation seatrout. I started at the downstream end of the stretch and by casting up and across I worked my way up five or six paces at a time. To be honest it looked fairly dead and I'd only had one or two tentative pluckers before it began to get pretty dark and I was nearing the top of the section. 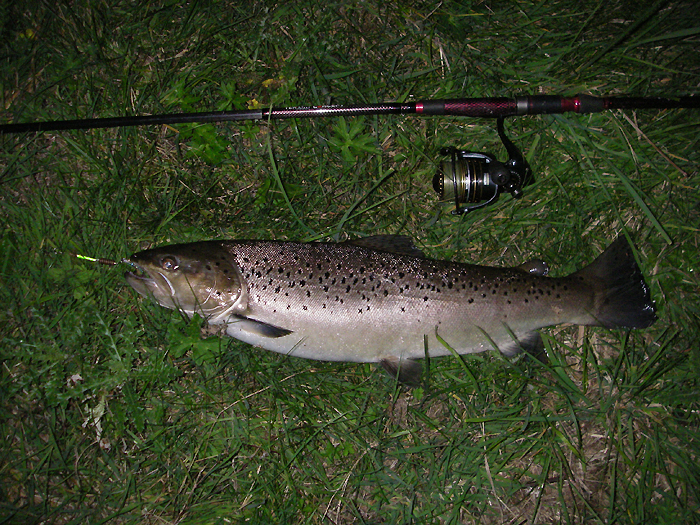 I knew that the by this time of the evening the trout were likely to be in the tails of major pools and I was encouraged when there was a bow wave and a tug on the line as the spinner came downstream. The big advantage of the fine Nanofil line that I use for this fishing is distance. The fish are pretty wary of anything on the bank and time and again I've scared decent fish simply by approaching too near, so it pays to make long casts from a position well downstream if possible. I'd been fishing for almost an hour and was just thinking that it might be time to 'give them best' when I approached the last big pool. More in hope than expectation I cast the spinner well up into the pool and started to wind just fast enough to avoid snagging while keeping the blade ticking over. "The lure must be almost at the lip of the faster water now," I thought. There was a fierce pull on the line and a big fish exploded from the water and hurtled downstream towards where I stood. Every few seconds the seatrout hesitated in its rush to leap again. Ten or a dozen times it flew into the air thrashing and splashing wildly while I simply hung on to the rod with my heart in my mouth. Even though I couldn't see too much in the gloom it was clearly a nice seatrout and I didn't want to lose it before landing it, weighing it and having a good look. After five minutes of hectic action the fish (and me) was beginning to tire a bit. I had it more or less under control and swimming close to the bank where I stood. Now came the tricky bit - landing it without a net. Usually I can slide into a shallow spot and lift them out or beach them but here the bank was two feet above relatively deep, fast flowing water. I lay down on my belly in the nettles and handled the line in towards me until I could reach down to the trace. At this point it was a toss up whether I extracted the fish or slid head first into the drink. I was lucky. I just managed to lift the head of the fish enough, so that I could get a grip on it with my right hand (my left hand's just an ornament) and drag it onto the grass beside me. Phew!!! What a relief. 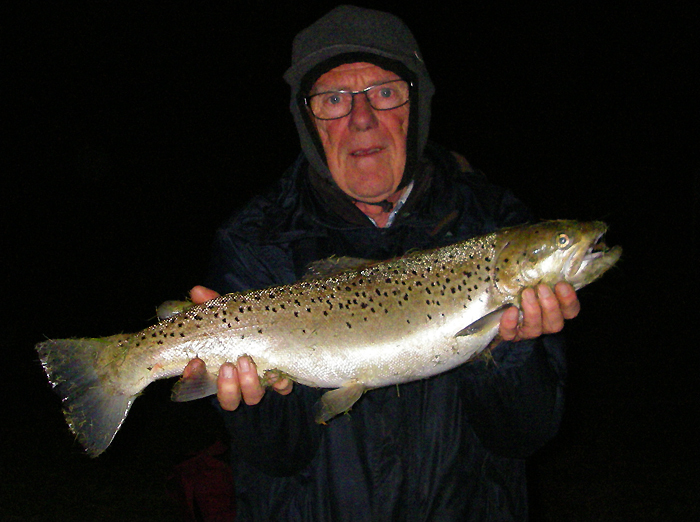 I took a couple of piccies, unhooked it, popped it into the bag and weighed it at just under nine pounds. My best this year and almost making up for missing out on the bass/mullet fishing.